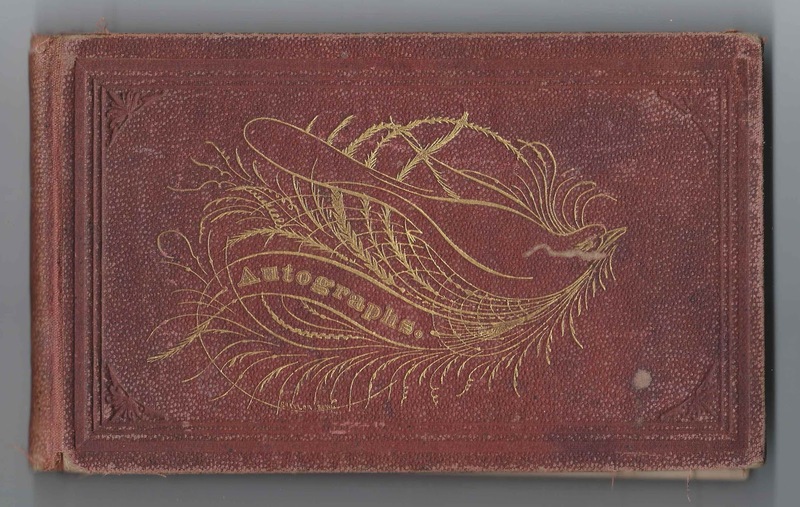 1870s/1880s autograph album that belonged to Clara Belle Shurtleff, "Belle", of White Rock, Gorham, Maine. She wrote her name below as Belle C. Shurtleff, and some records have her name that way. A few pages throughout have a preprinted design, like the one in which Clara incorporated her name. 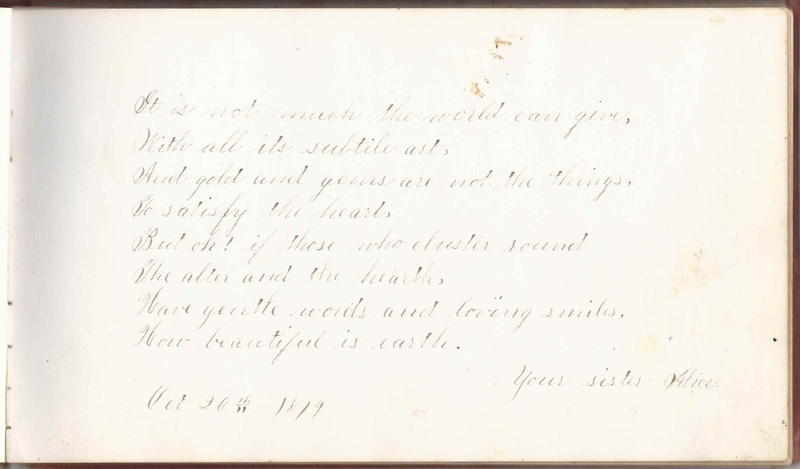 The album is approximately 8" x 5" and contains the sentiments of 37 of Belle's relatives, friends and teachers. An alphabetical list of the signers appears at the end of this post. Clara Belle Shurtleff was born 31 December 1860 at Gorham, Maine, the daughter of Atwood Symonds Shurtleff and Mary Elizabeth (Harmon) Shurtleff, who were born at Raymond, Maine, and Bridgton, Maine, respectively. 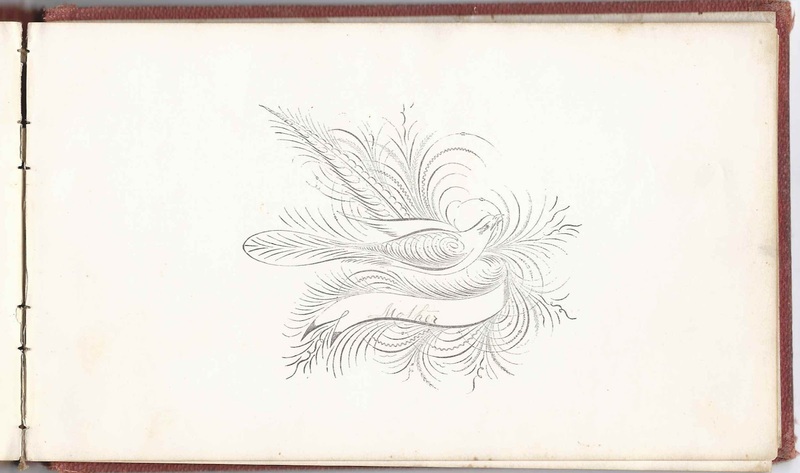 Belle's mother signed the last page in the album and may have penned the left facing page as well. Both are shown below. Three of Belle's siblings signed pages in her album. 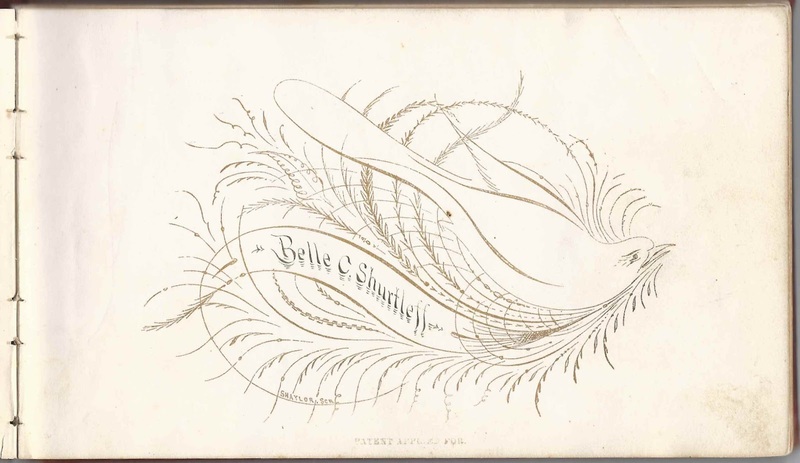 Nettie May Shurtleff signed a page on October 26, 1879. 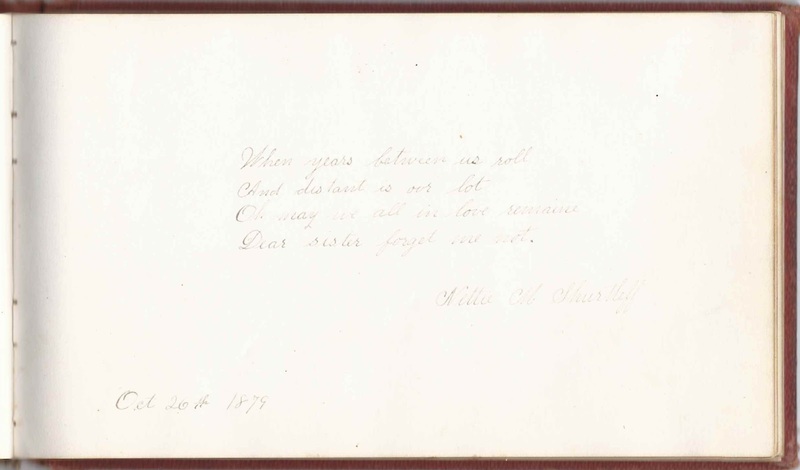 Sister Helen Winifred Shurtleff, "Nellie", signed a page on February 13, 1882. 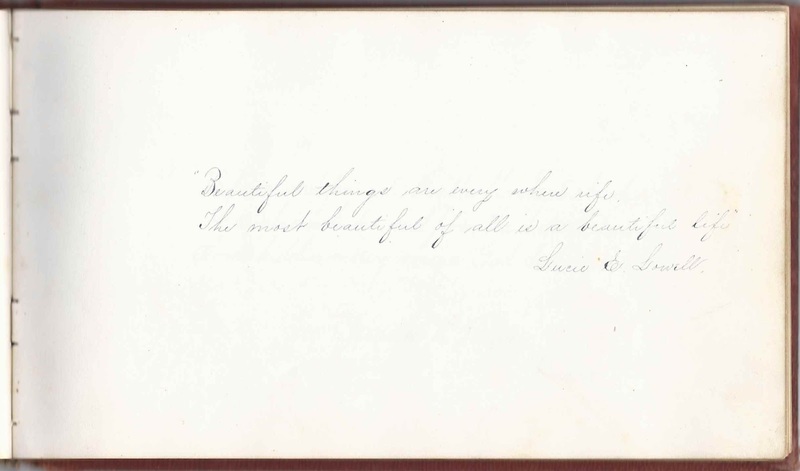 Sister Alice Atwood Shurtleff signed a page on October 26, 1879. Other relatives, including aunts, cousins and in-laws signed pages. Refer to the list below. 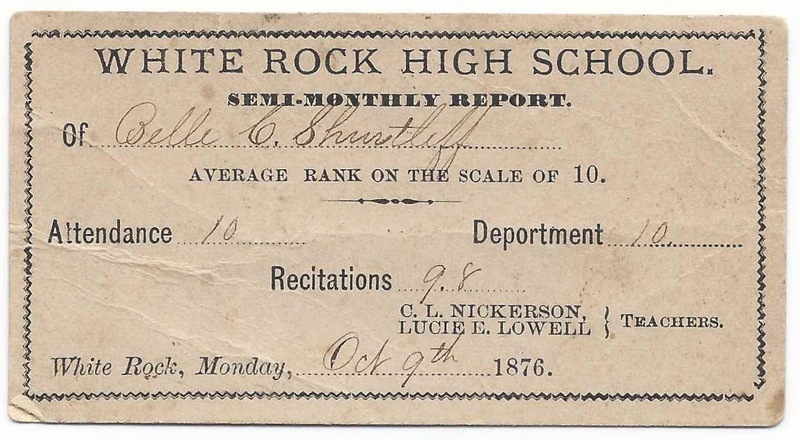 Belle was a good student, as indicated by this tucked-in semi-monthly report of October 9, 1876. The teachers named on the report were C. L.Nickerson and Lucie E. Lowell. 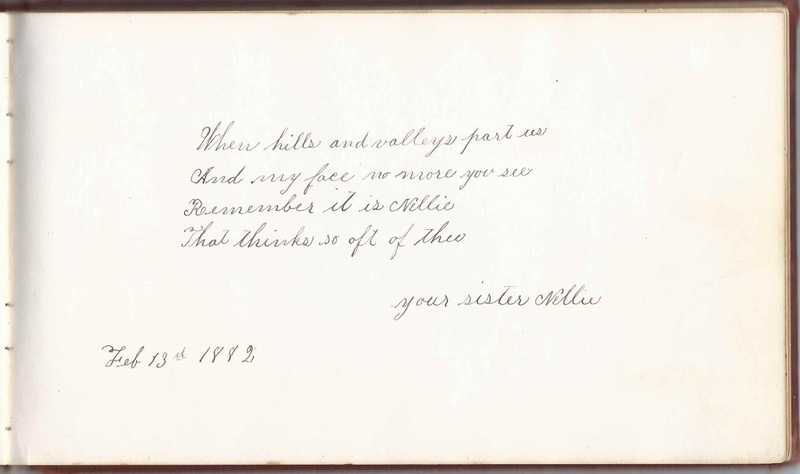 Lucie inscribed a page in Belle's album. 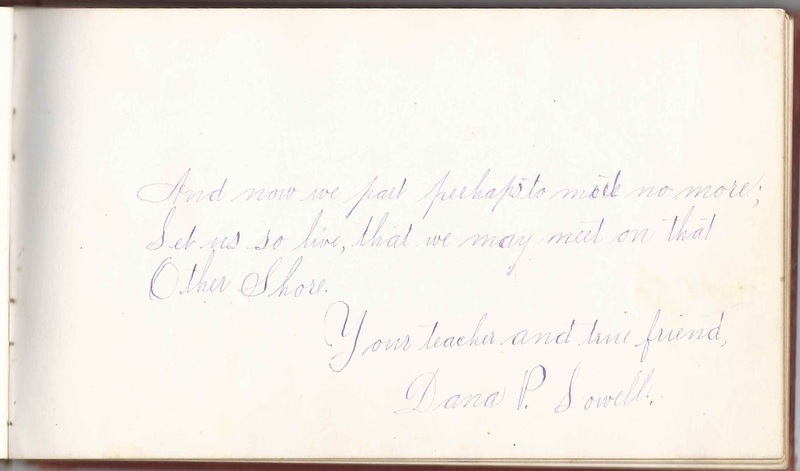 Another teacher who signed a page in Belle's album was Dana Pierce Lowell. About 1879, Belle married Joseph Franklin Young, son of George Gray Young and Martha Ann (Parker) Young. Joseph was born about February 1851 at Standish, Maine. Belle and Joseph Franklin Young farmed and raised, I believe, eight children. Though Belle was listed as married, Joseph Franklin wasn't listed in the household in the 1910 Census of Gorham, Maine, perhaps an oversight or perhaps for some other reason. He died in 1914. Belle lived until 1934. E. M. Harmon of South Bridgton; Belle's aunt. She was Elvina M. (Corson) Harmon, wife of signer William Lewis Harmon and mother of signer Lizzie M. Harmon. William Lewis Harmon was a brother to Belle's mother Mary Elizabeth (Harmon) Shurtleff. William L. Harmon of South Bridgton, Maine. He was William Lewis Harmon, brother of Belle's mother Mary Elizabeth (Harmon) Shurtleff and husband of signer Elvina M. (Corson) Harmon and father of signer Mary L. Harmon. A. A. Loomis of Westfield, Massachusetts, signed on October 3, 1884; mentions Sebago Lake on September 30. Eugene W. Loomis, signed at Westfield, Massachusetts, on October 3, 1884; he called himself Belle's brother, but was actually the husband of Sarah Frances (Young) Loomis, sister of Belle's husband Joseph Franklin Young. Belle's brother-in-law. His wife signed the right facing page. Sadie F. Loomis of Westfield, Massahusetts, signed on October 3, 1884. She was Belle's sister-in-law, Sarah Frances (Young) Loomis, wife of signer Eugene W. Loomis, who signed the left facing page. Frank W. Payne of Monson, [no state given; possibly Monson, Maine or Massachusetts or ?]. The word "Mother" is incorporated into one of the several preprinted designs interspersed throughout the album. Belle's mother was Mary Elizabeth (Harmon) Shurtleff. She may have signed the facing page at left, which does not bear a signature. William J. Twist, signed at White Rock, Maine, on November 25, 1875. The Mary Twist who signed on the same day but in a different part of the album, was presumably his wife. Mary Twist, signed at White Rock, Maine, on November 25 [no year written]. Perhaps wife of signer William J. Twist, who signed on the same day but in a different part of the album.